Slice the shallots into very thin rings and place in a bowl. Toss with cornstarch until the shallot rings have separated and the shallots feel dry. Heat about one inch of oil in a small shallow pan until to about 225°. Set paper towels on a plate and set aside. Add half the shallots to the pan and swirl with a slotted spoon. Cook until the shallots turn a blond color and immediately transfer to the paper towels. Turn the heat up on the oil to reach 325° -- or hot enough that one of the already-fried shallots rings immediately sizzles when added to the oil. Fry the shallots a second time for 10-20 seconds until they puff slightly and caramelize. Transfer shallots back to the plate to cool. Season the beef generously with salt. Melt the butter and combine with the fried shallots, chile powder, molasses, salt and white vinegar. "Rub it all over the beef like you want to spend the rest of your life with that beef and no other beef (but don't make any promises to that beef or it will wind up hating you for the rest of its life). At this point it would be best to put that beef in a container and let it hang in the refrigerator overnight. But you're impulsive and want to eat beef now. Okay, well then cook it, don't be afraid; your parents always knew your were impulsive. That's why, despite a lot of questioning and private conversations, they finally accepted your choice to be a cook instead of a college professor. Time heals all wounds, but roast beef waits for no man. Cook like you were born to do." I think that's Tyler Kord speak for" best if refrigerated overnight, but can be made the same day". Preheat the oven to 250° Put the beef in a roasting pan and cook it for 2-2 1/2 hours. Use a meat thermometer to determine doneness... 120° for rare, 140° for medium. I'm going for 130°. When the beef is cooked, remove from the oven and let it rest for half an hour before covering and refrigerating until well chilled. (It's easier to slice thinly when the meat is chilled). The recipe actually calls for smoking the ketchup -- as in building smoking apparatus on the grill. While we smoke things all the time, I just didn't have the temerity to to go through the ministrations on this one and I used the alternative that he suggested -- liquid smoke -- but he warns not to use too much otherwise it will taste like "cheap ham". Into a blender combine all the ingredients for the Smoked French Dressing and blend until smooth. Store in the refrigerator for up to a week. Combine everything in a plastic container with a tight fitting lid. Shake vigorously like you hate pickled red onions. (I swear the recipe says that). Let sit for at least 30 minutes but preferably longer, shaking occasionally. These will last for a very long time in your fridge. Preheat the oven to 450°. In a medium bowl, toss the onions, oil and salt together until thoroughly mixed. Place the onions on a baking sheet and cook until somewhat tender and a little burnt, about 20 minutes. Use a very sharp knife and slice the beef as thinly as humanly possible (he calls for a half pound of beef per sandwich - I'm not physically capable of eating that much meat on a sandwich, so I used about 1/4 pound). Preheat the oven to 375°. Place the bread on a baking sheet, cut side up. Put some of the roasted onions on each half. Put them in the oven and cook until the onions are warm and the bread is toasted, about 6 minutes. Put 1/2 pound (his instruction, not mine) of roast beef on each of the 4 bottom pieces of bread. Drizzle some smoked French dressing on each sandwich. 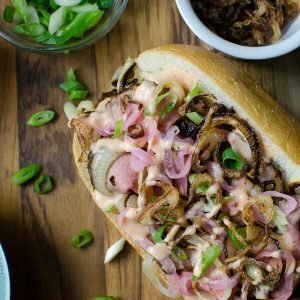 Top each sandwich with a quarter of the pickled red onions, fried shallots and scallions. Put the tops on the sandwiches and serve. Tasting notes -- I would add some fresh cilantro leaves to this sandwich.